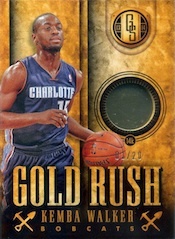 2013-14 Panini Gold Standard Basketball takes the gold theme to all corners of the set. 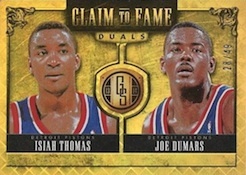 The high-end product promises four autographs and a memorabilia card in each ten-card box. 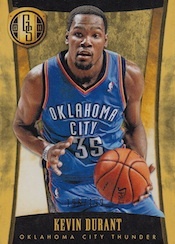 The 2013-14 Panini Gold Standard Basketball base set has 275 cards. 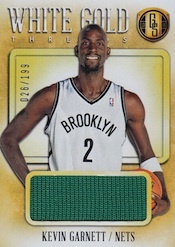 This makes it a challenge to complete given the small number of cards per box. 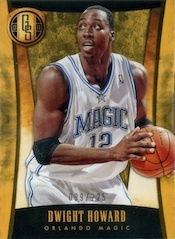 Twenty-five variations showcase players in the various uniforms they've worn over the years. 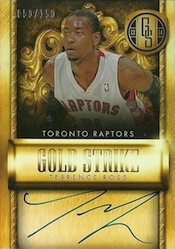 Not surprisingly, rookies have both autographs and memorabilia cards in 2013-14 Panini Gold Standard Basketball. As with past sets under the brand name, "gold" isn't just a part of the name. It runs throughout the product, both in the designs and the insert names. Metal is a large 90-card set that lives up to its name with card stock made from actual metal. 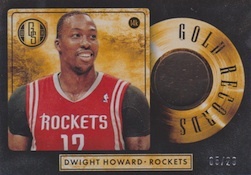 Solid Gold returns with cards made of 14-karat gold. Finals MVPs showcase top postseason performers. 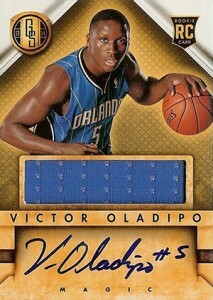 Although they don't come signed or with memorabilia, they are extremely limited coming numbered to 20 or less. The championship theme continues with Ring Bearers. 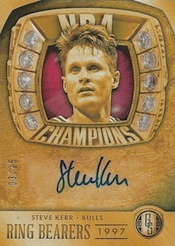 The autograph set features only NBA Champions. All are numbered to 99 or less. 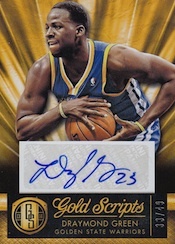 2013-14 Panini Gold Standard Basketball has four additional autograph sets, each numbered to 199 or less. 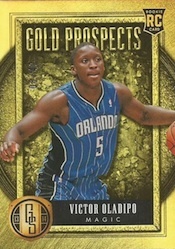 Memorabilia cards are led by Bullion Brand Logos. 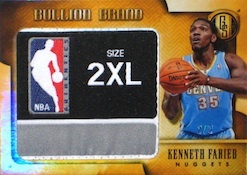 Numbered to 2, these patch cards have emerged over the past couple of years as one of the brand's trademarks. Bullion Brand and Black Gold Threads also feature large memorabilia swatches. 35 cards. Click here for a detailed visual guide. 25 cards. 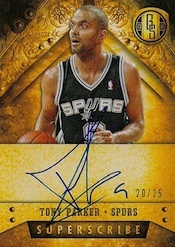 Total print run for each player is 225.
sticker auto on a “high-end” product always make me laugh. Panini have the most powerful product in the market, but, even if they have de best redemption attendance, they stick with sticker auto too easily to convince me to spend more on their products. 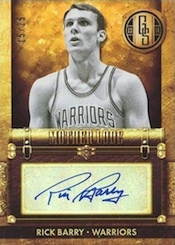 If there is one product that stand out from Panini it is Gold Standard. 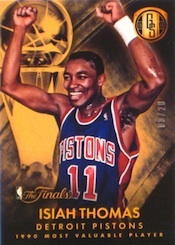 Hoops is level 1, Prestige level 2 and Gold Standard level 3. The only three products worth buying. 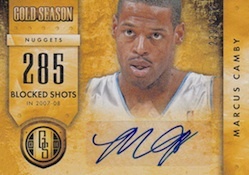 Finals MVP looks promising, an auto or memo would have made it awesome. 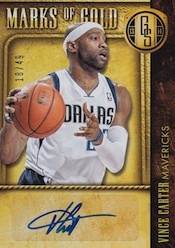 Ring bearers should include actual teams perhaps like 2011 Dallas Mavericks (they are easy to sign except for Shawn Marion). 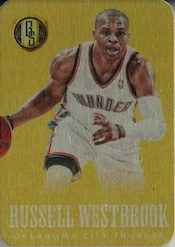 Hopefully Panini improved on it each time, but Gold Standard is really good value for your money. Did a case break at the local card shop and it was rather impressive to see these cards. 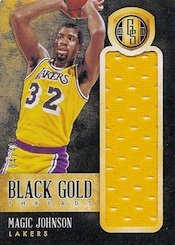 especially the card with a solid piece of gold. Probably impossible to collect the whole set but if you have some extra money to throw around then pick one up. that and I barely rate this set a 4 accordingly. set is so nice it almost looks high def. I give this set 4 stars. the cards are beautiful but i hatr to get the hit of the box aa redemption card. That drives me crazy..